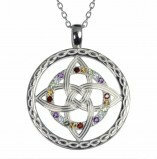 Colors of Ireland pendant, the blue sea, purple heather, green grass, sun and landscape are all gathered together in this stunning Celtic pendant. Featuring gorgeous rope-effect work, this pendant will be a family heirloom. Celtic knots are symbolic of everlasting love and eternal life - a perfect gift for a birthday, wedding day or mom's gift for a baby's birth. They are inspired by the beautiful and very colorful drawings that decorate the Gospels in the Book of Kells.